The decision was now taken to use the LSL's to continue 5th Infantry's move forward. "Sir Tristram" reached Fitzroy on Monday 7th to start unloading ammo, and in San Carlos Water, "Sir Galahad" took on board the rest of the 1st Welsh from "Fearless" before sailing around Lafonia to arrive on Tuesday morning (8th). By now, only one LCU and a Mexeflote were left to complete offloading "Sir Tristram", and although by early afternoon, Rapier SAM's and 16 Field Ambulance had gone ashore from "Sir Galahad", plans to move the Guards to Bluff Cove to join the rest of the battalion had come to nothing. Worse still, the LSL's had been reported by enemy observers, and around 2.00 pm, five Skyhawk's of Grupo 5 and five Daggers of Grupo 6 were coming in over the Falklands. First to be attacked by the Daggers, but in Falkland Sound was frigate "Plymouth" on her way to bombard an Argentine position on West Falkland. Hit by cannon fire and four UXB's, one of which detonated a depth charge, she was only slightly damaged. Shortly after, the Skyhawks reached Fitzroy. Three of them put two or more bombs into the crowded "SIR GALAHAD", and the other two hit "Sir Tristram" with two UXB's killing two crewmen. The ships caught fire and were soon abandoned, but by then the results for "Sir Galahad" were catastrophic with a total of 48 killed - five RFA crewmen, 32 Welsh Guards and eleven other Army personnel, with many more badly burned and wounded. "Sir Tristram" was later returned to the UK for repairs, but the burnt-out "Sir Galahad" was scuttled at sea as a war grave on the 25th June. As the FAA's last major effort continued, four Grupo 4 Skyhawks attacked troops in the Fitzroy area later that afternoon, and minutes after, four Skyhawks of Grupo 5 arrived over Choiseul Sound to catch LCU F4 (belonging to "Fearless") sailing from Goose Green to Fitzroy with 5th Infantry HQ vehicles. Hit by one bomb, which killed the coxswain, Colour Sgt Johnston (post QGM) and five of the crew, she shortly sank. Two No.800 Sea Harriers over head on CAP immediately dived to the attack and brought down three of the Skyhawks with Sidewinders [a67, a68, a69]. During the week, both Land Forces and 5th Inf HQ's moved to Fitzroy and 3 Cdo Bde's to Mount Kent, and although the "Sir Galahad" disaster caused delays, planning continued for the attack towards Stanley. In the first phase, 3 Cdo Bde would take Mount Longdon, Two Sisters and Mount Harriet, and if possible Tumbledown Mountain and Wireless Ridge. Otherwise these two plus Mount William would be assaulted in phase two, and Sapper Hill and the ground south of Stanley in phase three. As part of the build-up, 3 Cdo continued its reconnaissance patrols, and the special forces their covert operations, but with casualties. Only the previous week, an SBS sergeant was killed in an accidental clash with the SAS, and over on West Falkland, as the SAS kept a careful watch on the two large Argentine garrisons there, an observation post near Port Howard was surrounded on Thursday 10th and Capt Hamilton killed as he tried to fight his way out. With seven of the eight infantry battalions and all five 105mm batteries forward, the first phase started on the night of Friday 11th, and by next morning 3 Cdo Bde was on Mount Longdon, Two Sisters and Mount Harriet, but during the night there were other losses. The supporting warships shelled Argentine positions in the mountains, and near Stanley, a house in the capital was hit killing two women and mortally wounding a third in the first and last civilian deaths of the war. Then as destroyer "Glamorgan" (pictured above) retired out to sea after 45 Cdo's attack, a land-launched Exocet fired from Stanley hit her in the hangar area, badly damaging that part of the ship, killing thirteen men and destroying her Wessex [b34]. The second phase was delayed until Sunday night (13th), but by the morning, 2 Para had taken Wireless Ridge and 2nd Scots were on Tumbledown, but too late for the Gurkhas to assault Mount William in the dark. The movements during the week of the attacking battalions, including the Gurkhas (less C Coy at Goose Green) are covered by Parts 44-48. As for 40 Cdo and the 1st Welsh, the badly depleted Guards stayed at Bluff Cove until Friday 11th when they were reinforced by A and C Coys 40 Cdo released from San Carlos defence (B Coy remained), and marched that day to the south west of Mount Harriet to stay in reserve for the next two days. During this time, a battalion dispatch rider was mortally wounded by Argentine shellfire. Even aside from the Tuesday strikes, there was little let-up in the air-war during the week. On Monday morning (7th), a reconnaissance Learjet of FAA Grupo 1 was shot down over Pebble Island by one of "Exeter's" Sea Darts [a66]. Next day, the last two RAF Harrier GR.3's from Ascension arrived on "Hermes", and earlier, the fourth and last GR.3 lost was damaged beyond repair landing heavily at the Port San Carlos FOB with a partial engine failure [b33]. On Wednesday, RFA "Engadine" flew off her four Wessex HU.5's of No.847 NAS to San Carlos Water to add to the helicopter lift, and early Saturday morning, in "Black Buck 7", Stanley airfield was bombed by a Vulcan for the final time. 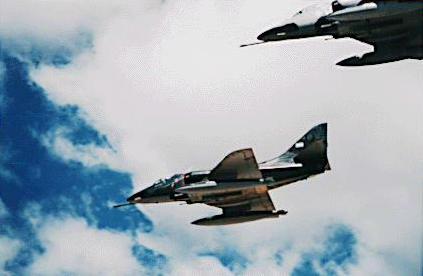 Sunday 13th saw the last Argentine air raids. Late that morning, Skyhawks of FAA Grupo 5 concluded their successful war with an attack on 3 Cdo Bde HQ on Mount Kent and 2 Para on Mount Longdon, but without causing casualties, and that evening, two Grupo 2 Canberras bombed Mount Kent, and as they turned away, one was brought down by a Sea Dart from "Exeter" (or possibly "Cardiff") [a70]. All this time, RAF GR.3's were hitting Argentine positions around Stanley, and still on Sunday, made their first successful laser-guided bomb attacks. FAA Skyhawk A-4 attack bombers of the type which mortally damaged RFA Sir Galahad, badly damaged Sir Tristram and sank LCU F4 on the 8th June. In return they lost three of their number.